Design and Create. Here’s the recipe. If you own Martini glasses but don’t use them often enough to justify the space, send them from the bar to the kitchen. When they come out, filled with food instead of drink, family and friends will be delighted. If you have oversize Martini glasses, so much the better. If you don’t like fennel, substitute ingredients you do like in the recipe below, from EatWisconsinCheese.com. Also take a look at this Dirty Martini Salad—simple greens with olives and an olive dressing (the dressing has chopped olives, vodka and olive oil). 1. WASH and thoroughly dry the fennel, celery and romaine. Cut the fennel into thin slices, about 2 cups. Cut the celery into julienne strips, about 1/2 cup. 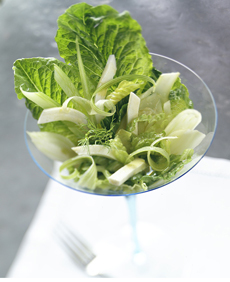 Reserve four well-shaped romaine leaves for garnish; then cut the remaining romaine into julienne strips, about 3 cups. Cut the mozzarella into thin strips. Place all into a large mixing bowl. 2. PUT the olive oil, lemon juice, mascarpone, mustard, salt and pepper in a blender container. Blend until thick and smooth, about 5 seconds. Pour over the salad; toss to coat. Divide the salad, arranging on serving plates, using the reserved lettuce leaves for garnish. 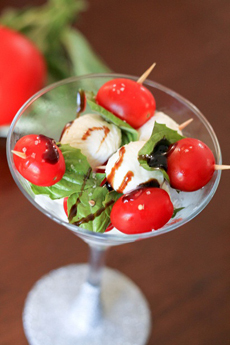 *Bocconcini are bite-size fresh mozzarella balls. You can substitute ciliegine (cherry size) or perlini (pearl size) if you can’t find bocconcini. Here’s a recipe that adds bowtie pasta for a Caprese pasta salad.